Stock market breath indicators measure the degree to which the price of a market-cap weighted index, such as the S&P 500 index, and the broad equal weighted market are changing in harmony — looking for “confirmation” or “divergence”. With confirmation, expect more of the same. With divergence be prepared for the path of the index to bend toward the direction of the path of the breadth indicator. It works in a way similar to the physical world as described in Newton’s First Law of Motion, which says that an object in motion continues in motion with the same speed and direction unless acted upon by outside force. The object is the stock index price. The force is the breath indicator. There are multiple forces acting upon the object (the stock index), and it is the sum of those forces that determine the speed and direction of the index. Breadth indicators are among the more powerful forces, because they reflect the effect of other forces (such as earnings and growth prospects and microeconomic news) on each of the index constituents separately. Breadth indicators tend to be more effective at signaling impending market tops than market bottoms. 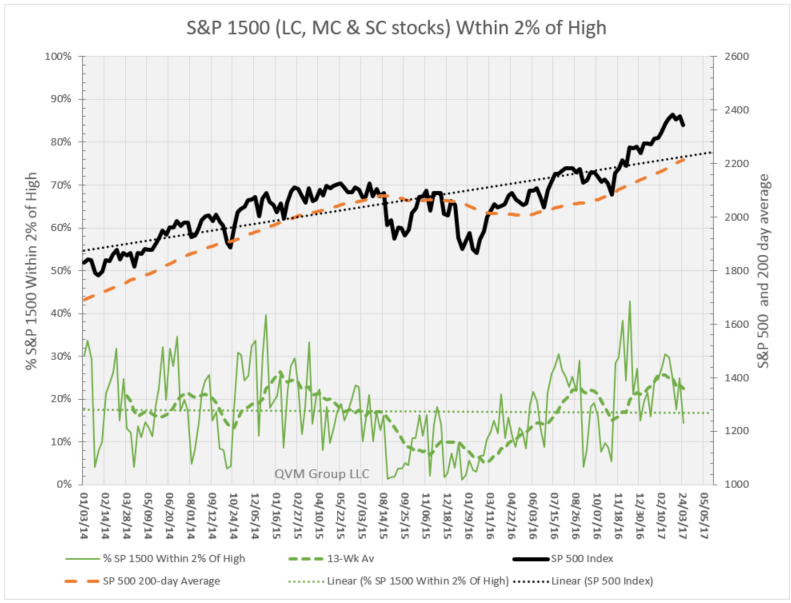 As more and more of the broad market issues move in the opposite the direction of the market-cap weighted stock index, the greater is the probability of reversal in the direction of the stock index. The breath indicator represents the equal weighted broad market, which normally peaks before the market-cap weighted indexes peak..
Additionally, when breath indicators reach extreme values in the same direction as a market-cap index, the market-cap index is thought to be overbought or oversold, and subject to moderation back toward the moving average. Let’s look at a few breadth indicators that we follow weekly to see what they might be suggesting at this time about the Standard & Poor’s 500. First, let us stipulate that the S&P 500 is in an uptrend. Actually most major indexes around the world are currently in up trends (see a recent post documenting trends around the world). Figure 1 shows our 4-factor monthly intermediate-term trend indicator in the top panel in black (100 = up trend, 0 = down trend, 50 = weak or transitioning trend). (see video explaining methodology, uses, and performance in a tactical portfolio since 1901). We look for divergences between the direction of the combined constituents of the S&P 1500 broad market index with the direction of the S&P 500 index. In Figure 2, we plot the percentages of constituents in a 10% Correction or worse; in a 20% Bear or worse; and in a 30% Severe Bear or worse versus the price of the S&P 500. This measure’s how much bad stuff is happening in the broad market. The weekly data is a bit noisy, so we also plot the 13 week ( 3 month) average shown as a dashed line over the weekly data. 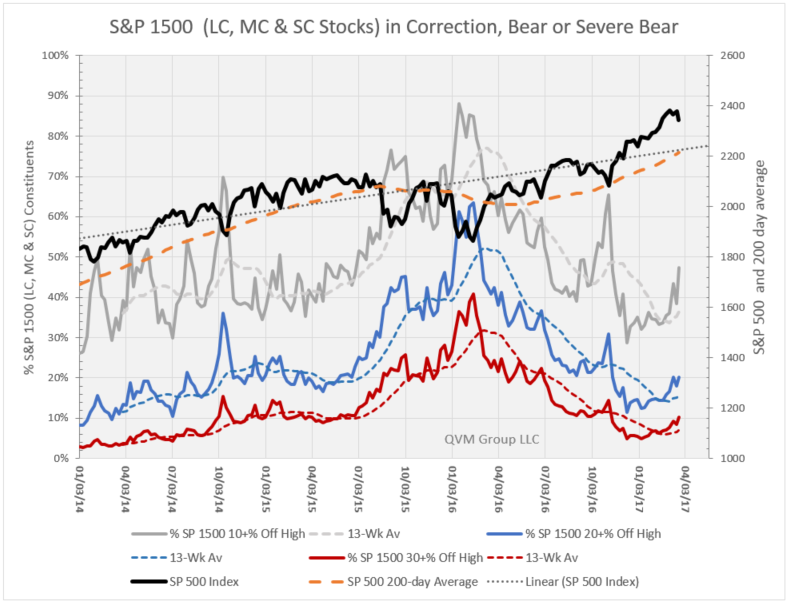 Leading up to the 2015 correction, these indicators (particularly the 10% Correction or worse indicator) gave an early warning of developing risk of a market reversal. 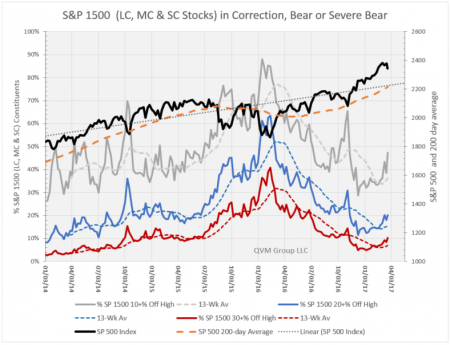 After the 2015 correction, those indicators continued to deteriorate, event though the &P 500 recovered; once again giving a signal that not all was well, which led to the 2016 correction. After the 2016 correction, those indicators improved rapidly until the period before the 2016 election where concerns were rising. After the election, the indicators once again improved very rapidly, but now those issues in Correction, Bear or Severe Bear are rising again, suggesting caution about the possibility of another market reversal. In Figure 3, we plot the percentage of S&P 1500 constituents within 2% of their 12 month high, versus the price of the S&P 500. This measures how much good stuff is happening in the broad market. 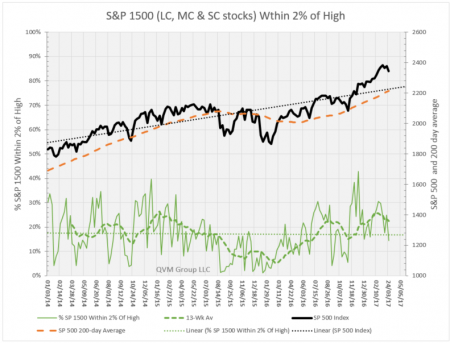 That breadth indicator began to decline months before the 2015 correction and continued to decline even as the market recovered from that correction, portending the early 2016 correction. The 13 week average turned down before the larger part of the corrective move preceding the 2016 election and rose after the election, but now it is rising again, suggesting the possibility for a corrective move in the near term. Figure 4 presents another breath indicator, which recall “Net Buying Pressure”. It measures the flow of money into rising and falling prices of the constituents of the S&P 1500 for comparison with the direction of movement of the S&P 500 index. The chart below plots the Net Buying Pressure for 3 months, 6 months, and 12 months. We multiply the price change in Dollars of each of the 1500 constituents each day, and multiply that change by the volume of shares traded each day. We sum the negative products, and sum the positive products. We then divide the sum of the positive products by the sum of the positive and negative products combined. If the ratio is more 50%, that means there is more positive product than negative product, which we called Net Buying Pressure. If the ratio is less than 50%, that means there is less positive product than negative product, which we call Net Selling Pressure. 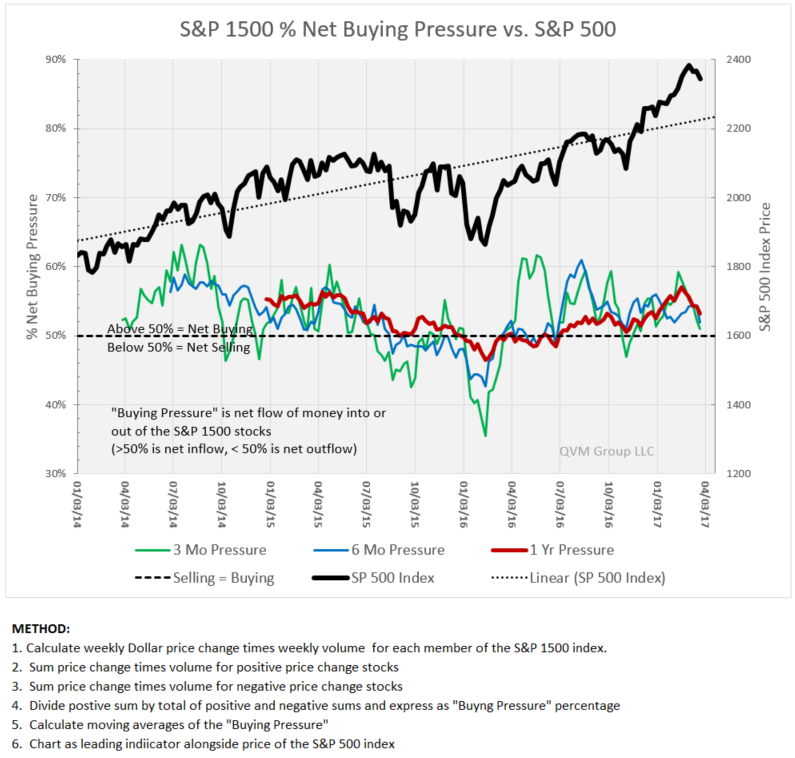 You can see in the chart that Net Buying Pressure began to decline in advance of correction in 2015 and continued to decline even as the index recovered before going into a second correction 2016. Since then net buying pressure has risen until just recently, when it has begun to decline again. That suggests to us trend in the S& 500 is not well supported by the broad market, and may be ready for a corrective move. Bottom line for us is the view that the broad market foundation of US stocks is materially weakening, making the major market-cap indexes (dominated by the largest stocks) increasingly, visibly vulnerable to a material corrective price move; which suggests a better time later to commit new capital than now. This entry was posted on Monday, March 27th, 2017 at 11:47 AM and is filed under Analysis, market conditons, technical analysis, trend following. You can follow any responses to this entry through the RSS 2.0 feed. Both comments and pings are currently closed.